We absolutely have an unending passion with variegated plants, something that we can’t garden without! One recent addition to our courtyard is the variegated Dianella ensifolia. An excellent companion plant, its marvellous foliage variegation of white and green bands truly accents the other contrasting colours and textures of the surrounding plants, as well as stands out to brighten up the whole area. We’re extremely delighted with this ornamental beauty that was added into our garden collection recently, about two months ago. 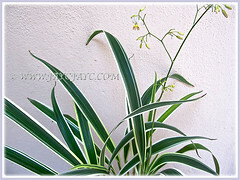 Botanical Name: Dianella ensifolia ‘White Variegated’ (syn. 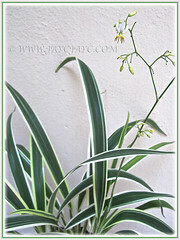 : Dianella ensata, Dianella nemorosa, Charlwoodia ensata, Dracaena ensata/ensifolia). Common Name: Umbrella Dracaena, Flax Lily, Common Dianella, Sword Leaf Dianella, New Zealand Lilyplant, Cerulean Flax-lily, Siak-siak (in Malay). Family name: Xanthorrhoeaceae (prior to 2009, it was classified in the Hemerocallidaceae family). Etymology: The genus name, Dianella is a Latin word for Diana, the mythical goddess of hunting and the sylvan goddess. 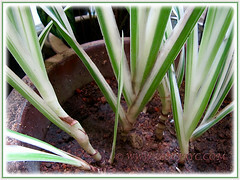 The species epithet ensifolia is a Latin word meaning with sword-shaped leaves, referring to shape of its leaf blades. Origin: Native to Madagascar, Temperate Asia: (Southern China, Taiwan, Japan),Tropical Asia: (Indian Subcontinent of Bangladesh, Bhutan, Nepal, India and Sri Lanka; and Southeast Asia comprising Myanmar, Thailand, Cambodia, Laos, Vietnam, Indonesia, Malaysia, Singapore and Philippines), plus the Pacific Islands. Plant type: A herbaceous, clumping and grass-like perennial. Features: Dianella ensifolia is an attractive species of the genus, Dianella that consists of about 41 species of flowering plants. It occurs naturally in primary and secondary forests to open grasslands, and from sea level to about 1,700 m altitude.It is a moderate-growing herbaceous and clumping shrub that can reach 1 m high and has creeping rhizomes. An evergreen perennial with sword-shaped leaves that are gradually narrowed at both end. Their leathery and stalkless leaves with scabrous margin are 30-80 cm long and about 2.5-4 cm wide, emerging alternately in two rows and have basal sheaths clasping the stem. 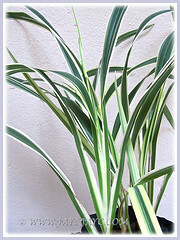 Plants can be solid green, blue-green, greyish-green or variegated. 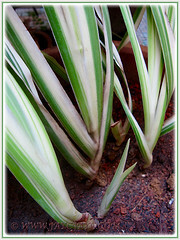 There are two variegated forms, ‘White Variegated’ or ‘Silver Streak’ with white and green stripes, while the ‘Golden Streak’ is variegated in yellow and green. 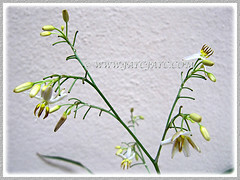 It produces a panicled inflorescence, 30-60 cm long, rising above the foliage from the tip of its stem. Star-shaped reflexed flowers (6 mm in diameter) in white to blue and purple, with prominent yellow stamens, adorn the flowering spike. These will be followed by shiny berry-like bluish to purplish fruits, containing 3-6 seeds that are ovoid, long, shiny and black. 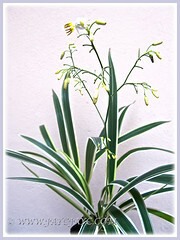 Culture (Care): Dianella ensifolia grows easily with minimum maintenance. Light: Full sun to semi-shade. Moisture: Moderate water requirement. Water regularly. Drought tolerant too. Soil: Grow in moist, sandy-loam and well-drained soils. Nevertheless, it’s adaptable to any free-draining garden soils. Others: Remove spent flowering stems and withered/yellow leaves to keep it tidy. Feed once monthly with a balanced organic fertiliser for healthy growth and flower production. No known pest or diseases. For subtropical and temperate regions: Hardiness: USDA Zone 9b-11. It is frost hardy and tolerates drought and windy conditions. Flowering will be from late spring to summer. Propagation: By seed or division of clumps that spread with rhizomatous roots. Usage: Dianella ensifolia, the variegated form with its neat clumping habit will be excellent for mass planting in garden beds and borders. Great to add to your garden or landscape for a dramatic and spectacular effect with its distinctive variegated foliage. Ideal to be grown in large decorative pots, containers and raised concrete planters for year round contrasting colours against the greenery. With an erect, arching and architectural form, this beautiful shrubby plan is most suitable for an informal hedge and edging or as a focal point in your garden. Plant it to attract birds that eat its fruits, if you’re a nature lover. Also, it has folkloric/medicinal uses – do check out at Stuart Xchange for more info. Euphorbia tithymaloides ‘Variegatus’ is both gorgeous and toxic! 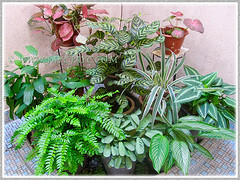 Your plants grow very well, vibrant and as for me, I can’t even plant pandan leaves! Maybe because I use them too much, they refuse to live in my garden. Much thanks for compliment, dear friend. 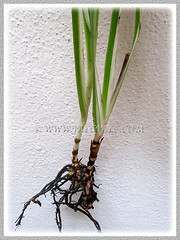 If your pandan plant is potted, I’d suggest that you replant them on the ground and with generous watering and sunshine, it’ll produce more suckers to supply your needs. All the best, Soke Hah. of solid leaves mixed with the variegated ones. Is that ok or should I pulled them out?